Lynda Grace An Hour Away: Bathing Suit Update - Which One Did I Choose? 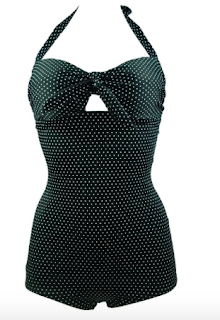 In my last post I wrote about shopping online for bathing suits. I promised I would provide an update once I received the suits and tried them on. Recap: I ordered three suits from Amazon. The manufacturer is Cocoship. The price of each of the suites was around $24.00. A general opinion about all three. Quality: I would rate the quality of the suits as fair. If, like me, you are going to be using these in a chlorine filtered pool, the suits are most likely only going to be one season suits. They were worth the $24.00. Fit: Personally they were true to a size I would normally wear. The material is soft and silky. I felt comfortable in the suits. I would give suit No. 1 ☆ ☆ ☆ out of 5. I liked the cut of the “boy short" style bottoms. The top’s peek-a-boo cut out was too revealing for my taste. I would give suit No. 2 ☆☆☆ out of 5. This is the suit I was hoping would have been the one for me. It wasn’t. Because the bottoms have a high waist line and shirring, the style does hide certain problem areas, mainly stomach. However the top, again was too revealing for my taste. I would give suit No. 3 ☆☆☆☆ out of 5. It’s the one I will keep. 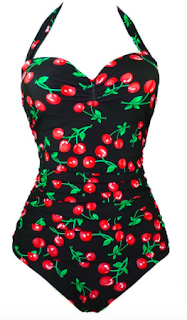 First, I like the vintage style cherry pattern of the fabric. The waist is shirred, which is a great concealer. The top is modest enough for my taste. I have already worn this to water aerobics and I felt comfortable. By the way, Ross thought I looked great in all three. But, I made him take photos of me wearing each of the suits, front, side and back. Ross, you are sweet. And I especially am grateful that your eyes are aging more gracefully than I am. Now I just have to figure out how to return the other two suits. They don't have return postage? I think if you go on Amazon, you can go into something about returns and get the postage thing to return it. You just wrap it back up in the packaging it came in (taped tightly) and ship it back that way. I don't remember exactly where it is, but it might be in Customer Service or the like. Glad you found one that works for you. Yeah, I think I did see something on Amazon about returns. It shouldn’t be that difficult. I was going to say that you should save one of them for next year, but one or two stars isn't worth it, right? No, I am pretty sure I wouldn’t wear either of the other two. You have a kind husband :) I would have gone for the third suit myself too over the styles of the others. Glad you were able to get one of them though and that it will work out. I know when we had a pool and were in it every day, suits tended to just last one season. I think chlorine is very hard on them even if you do wash them or rinse them in water afterwards. Thank you , I agree, I do have a kind husband. Because of the inexpensive price tag, I don’t mind this suit begin a one season suit.